So many musicians get given a title, James Brown, for example, was the Godfather of Soul, Elvis Presley was the King of Rock And Roll, Michael Jackson was the King of Pop, Aretha Franklin was known as the Queen of Soul and Paul Weller is known as the Modfather – although he hates that title, and there are many others, but do you know who was known as Godfather of Rhythm and Blues? My guess would be someone like Paul Jones but actually it was Johnny Otis. Never heard of him? Read on. Johnny was born Ioannis Alexandres Veliotes in December 1921 in California and in his 90 years on the planet achieved much; because he was a bandleader, singer, songwriter, drummer, vibraphonist, producer, club owner, disc jockey, preacher, talent scout and impresario. He inspired and discovered many singers and musicians alike. He hit the big time in 1946 when his big band version of Harlem Nocturne opened a lot of people’s eyes. On the Billboard R & B singles chart he charted 18 hits including the 1948, nine-week number one, Double Crossing Blues which was credited to The Johnny Otis Quintette, The Robins and Little Esther. He followed it up with the four-week chart topper Mistrustin’ Blue which gave Little Esther the lead credit. Today I focus on his 1958 number three hit Willie and the Hand Jive, which was banned by some radio stations in America because they thought, wrongly, as radio bosses do, that is was to do with masturbation. Mind you, with the words Willie and hand together you can understand why! He was inspired by his hero Count Basie and loved the sound he made but soon realised that he didn’t need the typical 16-piece ensemble that many bands of the 1940s and 50s had and so decided to slim it down a touch and bring in other instruments like electric guitar and some backing singers and thus created a sound that became known as rhythm and blues. The story is very simple, it just tells the story of a fictitious character called Way-out Willie who made his name just by doing a dance with his hands. The sound is reminiscent to that of Bo Diddley and is sung in a chain gang style, a sound that Johnny had heard whilst he was on tour. 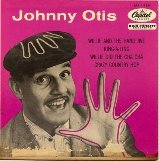 Willie and the Hand Jive has been covered by many act including Eric Clapton, George Thorogood & The Destroyers, Kim Carnes, The Tremeloes, Cliff Richard and the Grateful Dead among others, but not one has ever made the UK charts, not even Otis’ version. His only UK chart hit was a cover of the Eddie Cantor track Ma (He’s Makin’ Eyes at Me) which reached number two in 1957. Otis continued to perform into his 80s, and, just to add to his repertoire of skills, he also became a radio DJ and later on, an ordained minister and an organic farmer. He was inducted into the Rock and Roll Hall of Fame in 1994 as a producer and songwriter. He died in January 2012 at the age of 90.